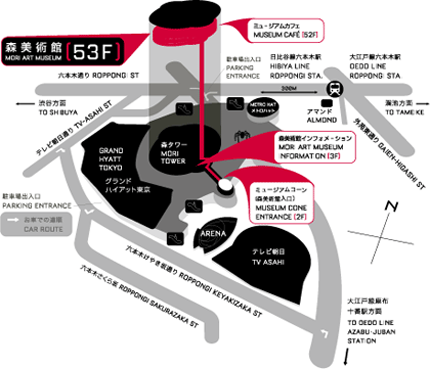 * Friday, October 21 open until 1:00 a.m. the following morning, and Saturday, October 22 open until 6:00 a.m. the following morning, respectively, due to "Roppongi Art Night 2016." * Group admission (Adult 1,500 yen; University / highschool student 1,000 yen; Child (Age 4 up to Junior highschool student) 500 yen) is applied to a group with members more than 15 persons. Group Admission Tickets are sold at ticket counter only. * Disabled persons and one accompanied person will receive half price discount for the admission upon presenting Disabled Person's Handbook or an equivalent form of government-issued identification. * Please be noted that you must wait in line to buy / exchange tickets, and enter the museum when crowded. Tickets available through: Mori Art Museum Ticket Counter, Seven Ticket (Seven Eleven)(Seven code: 046-683), Ticket Pia (P code: 767-669), Lawson Ticket (L code: 31647), e+ (e-plus), CN Play Guide etc. * Extra handling charge may incur. Please inquire respective ticket agencies. * “Limited-Period Pair Tickets” and “Official Mission Emblem Ticket Set” are sold at Seven Ticket only. Additional entrance fee to the Tokyo City View observation deck, Sky Deck and Mori Arts Center Gallery is required. * Combo ticket is sold at ticket counter only on the day of usage. Set of 2 tickets valid for entrance from opening day, Friday, July 30 thru Wednesday, August 31, 2016, only. * Limited to 1,000 pairs (2,000 tickets). * Offer ends once these tickets are sold out. 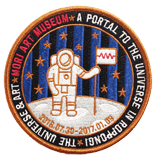 An advance sale ticket to the exhibition, plus an original “The Universe and Art” embroidered emblem (not otherwise for sale). * Limited to 1,000 sets. * The Emblem will be handed out at the Exhibition Museum Shop. * For more details see the Roppongi Hills website.